I avoided finishing this post all week because it was just too damn hard to tackle. You grow up, try to survive and the last thing you want to do is dig up memories from your childhood. Not because the memories are bad, but because you know you’ll never have those moments back. It’s easier to look forward than to realize how much time has passed. My father visited me last week. We went on typical dad-daughter adventures. My father moved away when I was a little girl and though we didn’t see one another often, we talked on the phone frequently. He was and continues to be a big part of my life in an unconventional way. Seeing him is always emotional for me. When I was little, it would hit me very hard. Now that I’m older, I try not to dwell on my emotions too much, but they typically get the best of me once I watch him walking through the airport door and later that evening when I’m alone with my thoughts. Here is a story of how I try to make sense of those feelings. I don’t remember what I was thinking the day Dad left. In fact, I don’t remember how old I was, what time of year it was, what words left Dad’s lips, whether or not I cried or what I was thinking. What I do remember is that he told me on the front steps of what would become the house of just my mother and I and that he was crying. What was he thinking when he was telling his 6, maybe 7 year-old daughter that he was leaving for good? Dad had come and gone at various times in my childhood. I was too young to recognize this, and my mother and father always seemed so happy and were so good to me, that I didn’t realize this was an abnormal setup. The only reason I know now that he was an intermittent figure in my developmental years is because my mother told me later on. Maybe subconsciously I knew he was an elusive figure; maybe I tried hard not to acknowledge it. What I do remember about Dad’s detachment from the family must have come after he sat me on those front steps, because after that he was not around as much. He moved to another state and me only being a child, it was left to him when we’d see each other again. At first it was every other week, then every few weeks, then he remarried and then it became every few months and then I became an adult and it was once or twice a year. That’s where we are today. 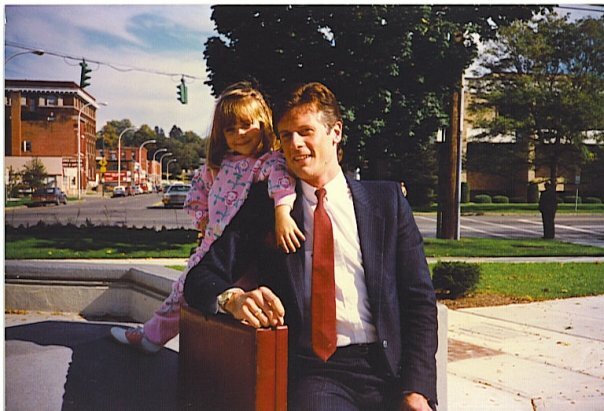 Due to not physically seeing my father on a regular basis for the majority of my childhood, I grew accustomed to not seeing him, but the road between that day on the front steps and my entrance into adulthood was a bumpy one. I recall days of waiting by the window, waiting anxiously for his car to pull into the driveway so we could start our adventure of limited time together. I’d see a car coming in the distance, squint, swear it was my father’s car and feel my heart rise into my throat. When the car would ultimately pass, my heart would fall and thus began a yo-yoing effect that would last for hours. You could physically pull me away from the window, but my mind wouldn’t detach. Every sight and sound was hyperfocused on one single entity: my dad. I recall lying in bed, hearing my father’s snores that weren’t there. I’d recreate the sounds because I missed him so badly. Who likes the sound of snoring? To me, it was the most beautiful noise. While my Dad was visiting last week, he took a nap in the other room while I napped on the couch. I heard the noise I had longed for so many years ago. It was subtle and I was reminded that his snoring was quiet. It’s interesting what time will do to you. I didn’t feel the pangs of longing upon hearing the noise. What I felt was a strange disconnect; I’m no longer that little girl. Or is she still in there? It’s typically not until my father leaves that it hits me hard. And I can’t tell you exactly what hits me, or what thoughts come to mind. All I know is that I cry uncontrollably. I have to. I assume it’s the little girl who used to stand by the window making herself known again. I no longer am left wondering what is going through his mind. He tells me. He tells me that a man is lucky to have a daughter. He hugs me at the airport and briskly turns away before he or I can catch the other crying. He reminds me every single day how proud he is of me, what a good job my mother did and that he can’t wait for more adventures. To every man out there who has a daughter: you have no idea how much you mean to her. Brilliant, heartfelt and under advisory. Thank you. I can totally relate to this post, Lauren. Thanks for articulating the feelings associated with this situation so well. “To every man out there who has a daughter: you have no idea how much you mean to her.” Until he’s f*cked it up in every way imaginable, and then, not so much. Kudos to your dad for making an effort, and kudos to you as well. Great post. It’s hard seeing a parent leave. My parents got separated when I was in third grade, and my dad always tried his hardest to see us, but my mom moved us a province away, and the visits became few and far between. My parents did end up getting back together later in my life, but now I’m the one who moves around. I miss them all the time, even when they’re just an hour away. I see my dad daily, so I obviously can’t speak to that part of this story, but I can relate to one small aspect. When I was little, really little, I was too short to see out our window. My dad built a small step stool for me to stand on so I could watch for his truck to come home after work. I’ve known a lot of single mothers, especially in my family – but there’s something about dads and daughters. It’s an odd relationship. Thank you for sharing this. Raw and revealing.